The diagram above shows how the ISO 9001 standard lays out the requirements for a Quality Management system. This is useful to show how it will work in your organisation. The Quality system begins with processes concerned with ‘Planning’. These involve defining issues that could affect ‘Quality’ in your organisation (i.e. the ‘Context’). These issues could lead to risks concerning products or services, or to opportunities that will help you improve them. The phase requires the development of a process for risk assessment, which will help you to prioritise risks and opportunities as your quality management system unfolds. After ‘Planning’, the ISO 9001 Standard sets our requirements for more Operational requirements (this would be ‘Doing’ in PDCA). The operational processes refer to the day-to-day activities that you carry out and how you achieve the ‘quality’ you need, such as sales, purchasing, manufacturing or service delivery, and ongoing customer services. These processes are defined by your requirements for quality, which could be informed by the Time-Cost-Quality triangle. What the ISO 9001 standard requires is that they are overtly planned, operated by people with known competencies, and documented to the extent that is needed. During the operational phase, you will need to monitor and measure the aspects of ‘Quality’ in the activities and processes your organisation carries out. The ‘Checking’ phase requires you interrogate the information you have gained through these processes in order that lessons can be learned and improvements suggested. These may be improvements in regards of the quality of the products or services, or in regard of the quality management system itself. In addition, you will need to carry out internal audits on processes and system requirements to ensure they are operating as you desire. All the information that is gathered through planning, operations and checking will be summarised for the purposes of the ‘Review’. The critical requirement in this phase is to conduct a ‘Management Review’ where your management team will define how the quality management system has improved the organisation, and what actions or opportunities exist to improve in the future. 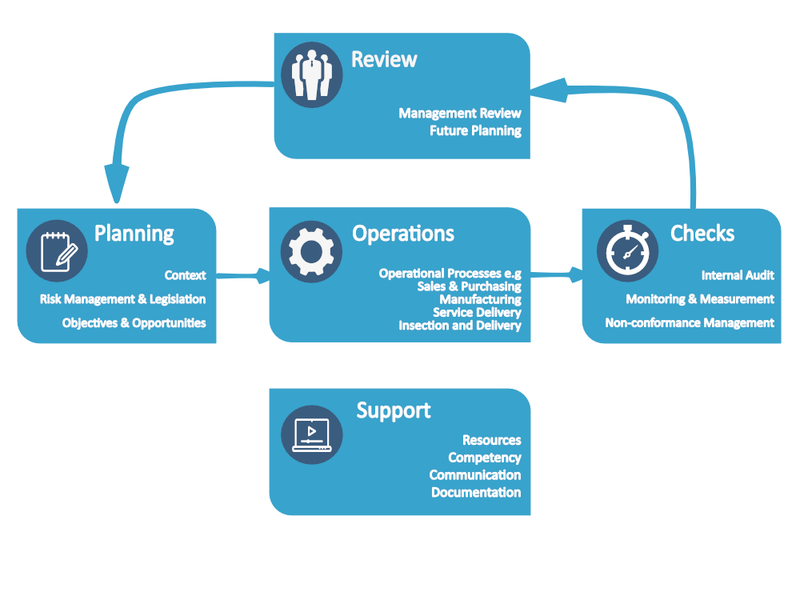 The management review will then set the agenda for the future roll-out, taking you back into ‘Planning’. Underpinning the entire quality management system are processes for ‘Support’, which include the need to provide equipment, people and finances necessary for the organisation to achieve it’s desired outcomes, and also to improve competencies over time. In addition, the support functions define requirements on such things as ‘documented information’ or ‘communication’, which will be useful to ensure that evidence of compliance is maintained over time.